Discussion in 'Windows Guides' started by Nimrod, Jan 14, 2010. Freecom decided when to make these ToughDrives to include a password feature, which while good for some people, is totally annoying for everyone else. Every time you plug the device in, it installs itself as a CD Rom drive and attempts to auto-install a password manager, which if your not using is a total joke. It also puts itself in your startup and runs on your PC even if your not using the drive. So if you plug it into a friends computer, they now have the Freecom Password Manager starting with Windows for no reason. This tool to remove it is available from Freecom, but they wont hand it out unless you ring there regional support, which makes no sense as to why they are incapable of putting this on there website. Luckily, I am sharing it out now for anyone who wishes to use it. Note: You must run these as an Administrator, If you are using UAC on Windows Vista or 7, you will need to right click and run as Administration. Then follow the guide and press Update, your device will then have the Virtual CD Removed. If you have previously ran the Password tool, or if you currently have a password set, please read the appendix before continuing! Please remove the following additional files from your Computer. Please restart your computer so that the password protection is removed completely from your system. B) If you have a password set for the current hard drive, you must remove it before running this tool as your data won't be accessible anymore! 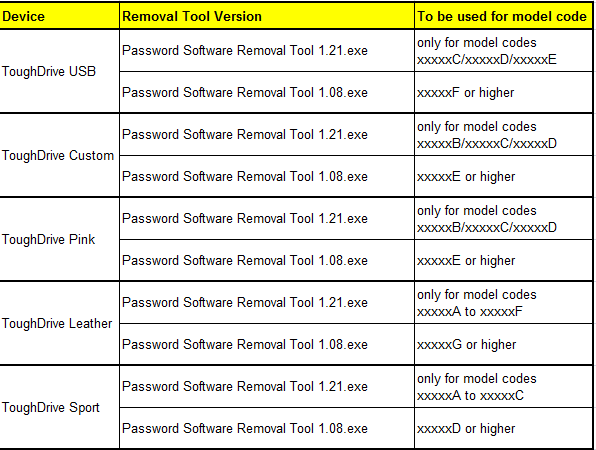 to remove the password protection on your Freecom product, please proceed as follows. P.KID, Trebor and CurlySteve like this. Hmmmmm I never saw this happen when I got my Freecom Toughdrive Pro all those years ago (26/03/2007 according to Ebuyer). I just plugged it in, formatted the drive and used it. Thanks for the guide anyway. It was brought into the newer models sir. Do you have the software for Mac OSX? I cannot run an exe file on my Mac but whenever I install the disk it mounts a Password CD virtual drive and also has a small partition on the HDD which I cannot format and erase. I'm afraid I dont have the software for Mac OSX, I'm not sure if they created it. It would be best to contact them and ask them, and if they do please let me know and I'll add the Mac OSX software to this thread. However, if you just wanna get rid of the Virtual CD drive quickly, just use a friends computer or some computer somewhere that has Windows and just run the tool on it. Once the tool has run, the Virtual CD will be gone when plugged into your Mac. I'm assuming you must be able to access a Windows computer somehow. It is recognized as a Freecom USB device when I plug it in, but no disks appear anywhere, and reflashing with 'official' firmware from the freecom website does not work because it does not recognize this drive. Can you not even create a partition then format it? When the Computer Management window appears click Disk Managment and see if you can partition / format the drive. Thanks InsaneNutter - but I already tried that, the drive only appears in device manager as something like 'usb freecom toughdrive', but it does not appear as a disk under diskmanagement. Partitionmagic can't make anything useful out of the disk too. The 1.08 tool flashes the disk just fine (while 1.21 does not recognize), but it is almost as if the no-password firmware is not compatible with the larger drives. Thanks Nimrod for a great article. If you have used the removal tool to remove the password software from the freecom USB toughdrive before you have disabled the password, then you have probably found that the hard drive is no longer accessible, and it will not accept formatting or partitioning. Running the password.exe file allows you to re-enter your original password, which will then allow you access to your hard drive. Once your hard drive is up and running, run the password.exe file again and remove your password. There is no need to run the password removal tool again following this procedure, you can just format or partition the hard drive as you like and never have a problem with it again! I have a ToughDrive Sport, but I have no idea what the model code is. All that's printed on the drive is a bunch of regulatory stamps. All I have found are the pci PROD/VEND flags, which don't tell me the model code. Any ideas?